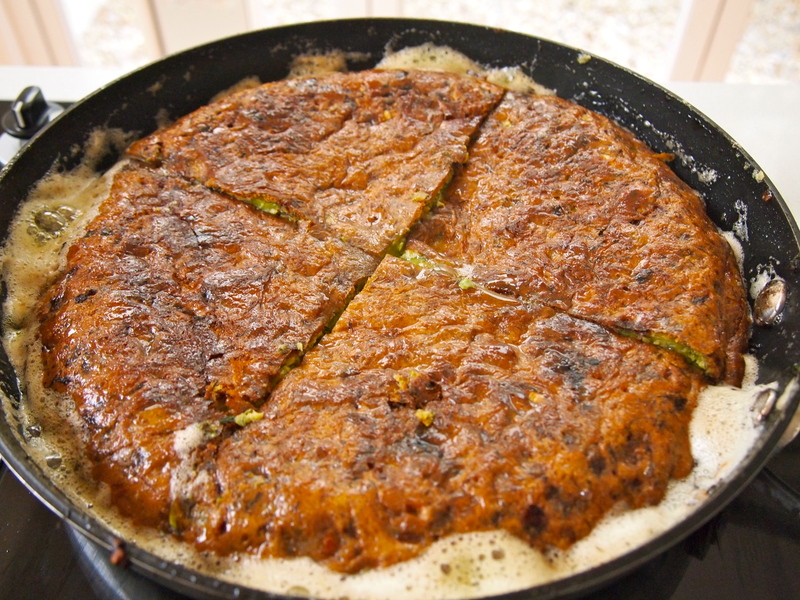 Kookoo is a Persian baked or fried egg dish not dissimilar to an Italian frittata or Spanish tortilla. There are many different varieties with most of them being vegetarian, the only meat based kookoo I’m aware of is one using minced lamb (kookoo goosht). 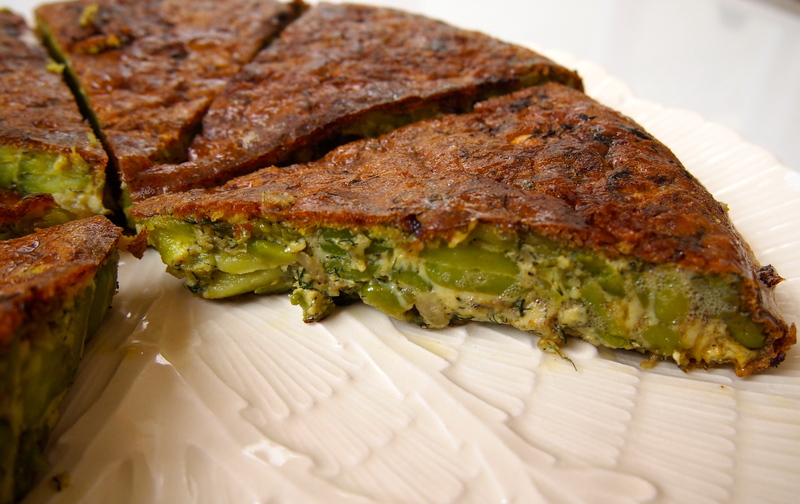 This kookoo using broad beans (fava beans) and dill is one that you don’t come across very often but the classic pairing of beans and dill make it one of my favourites. Kookoo make a delicious and satisfying light meal and whilst we sometimes eat kookoo at lunchtime it’s more normally served in our house as part of the main evening meal, along with either a khoresht (persian lamb and vegetable based stew served with rice) or a polo dish such as sabzi polo or shirin polo. There are a few different methods that can be used to make kookoo with some people preferring to bake it in the oven. My mother would always fry her kookoo gently on the stove top and I think this gives the best result. Just about every recipe I’ve seen for kookoo seems to include either baking powder or flour which I’m not a fan of. The flour and baking powder is used to firm up the kookoo and give it a raised, puffy appearance which I think is unnecessary, especially as the taste of the baking powder/flour is often discernible in the finished dish. As with frittatas and tortillas, kookoo is excellent portable food so perfect for picnics. This would also make a lovely starter for a dinner party, especially if you have vegetarian guests, or if you’re making a Persian meal and want to include another item on the menu then you can’t go wrong with a kookoo and this one is particularly delicious. 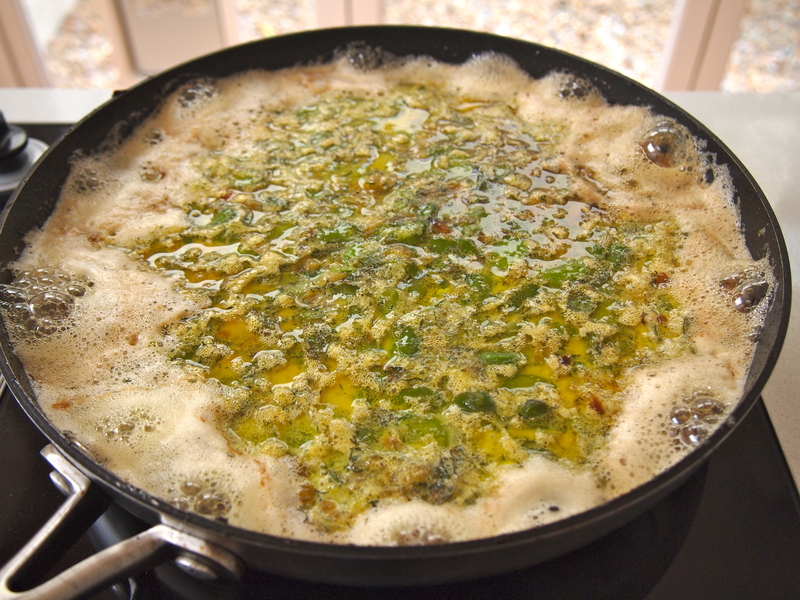 Heat a 28-30cm non stick frypan over medium heat and add enough oil to lightly coat the bottom. 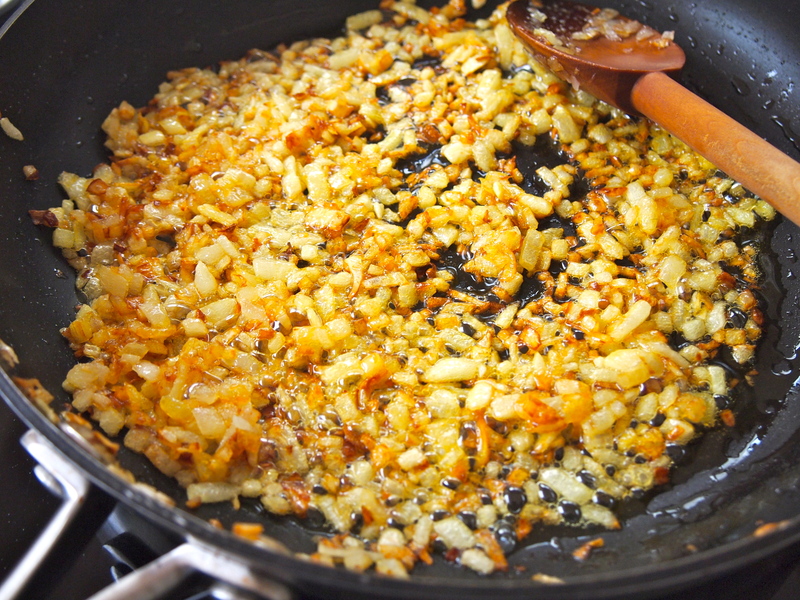 Add the onions and cook until golden brown and very soft. Add the turmeric and stir to incorporate and cook for a further minute. 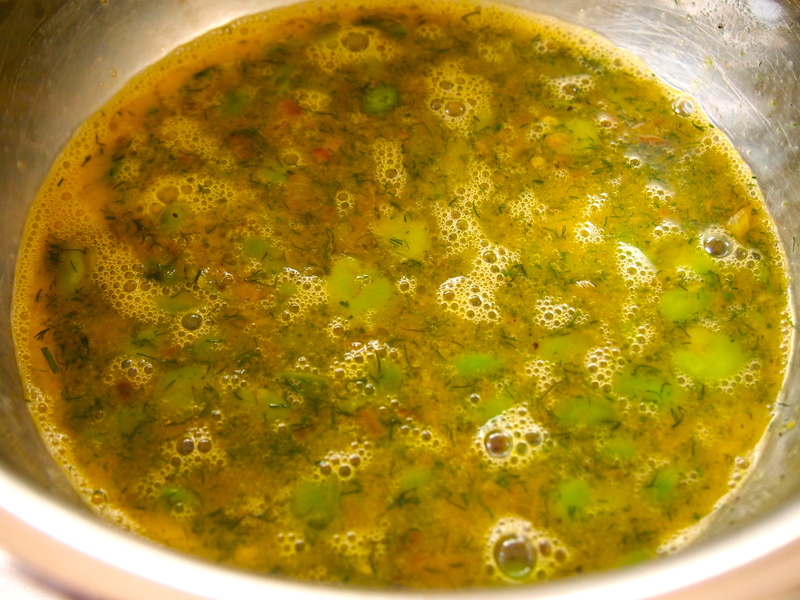 Add the broad beans and dill and continue to cook on a gentle heat for about 8 minutes. Season with salt and pepper. Remove to a bowl and allow to cool. Whisk the eggs in a large bowl and season with salt and pepper. 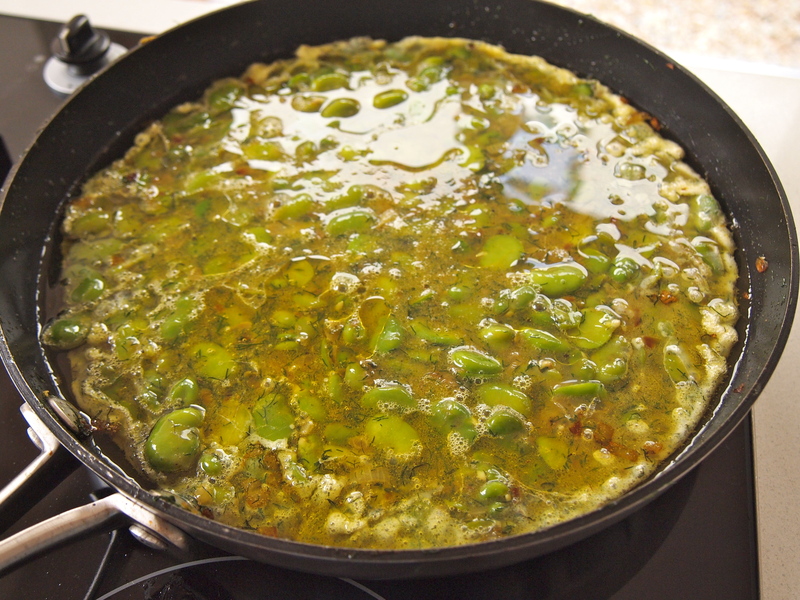 Add the cooled broad bean mixture to the eggs and stir to combine. Heat about a ¼ cup of oil in the same frypan used before; when the oil is hot add the egg mixture to the pan and spread it around evenly. Cook on low- medium for 30 minutes. For the last 15 minutes of cooking time I like to cover the pan with a wire mesh splatter guard. This lets some of the steam evaporate but still retains the heat. If you don’t have one then cover the pan lightly with foil. Keep checking the kookoo, adjusting the heat if it appears too fierce or increasing it if it’s not frying enough. After 30 minutes carefully cut the kookoo into 4 wedges. The kookoo at this stage will be firm enough for you to do this and then carefully flip each piece over and cook the underside for another 5 minutes. Turn off the heat, transfer the kookoo to a platter and cut into 8 slices. Serve either warm or at room temperature. I normally make my kookoo in advance and if I want to eat it warm I either give it a few minutes in the microwave or put it into a 180C oven for a 5 minutes. 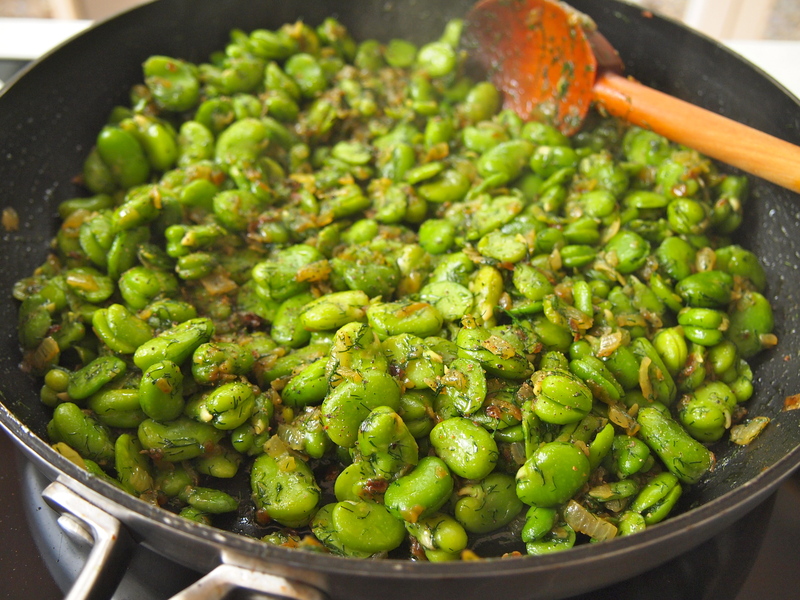 this seems very yumi!but is there any alternative for not using broad beans but some other kind of beans? Hi Pishpirikou and thanks for your comment. There are a lot of variations on kookoo. 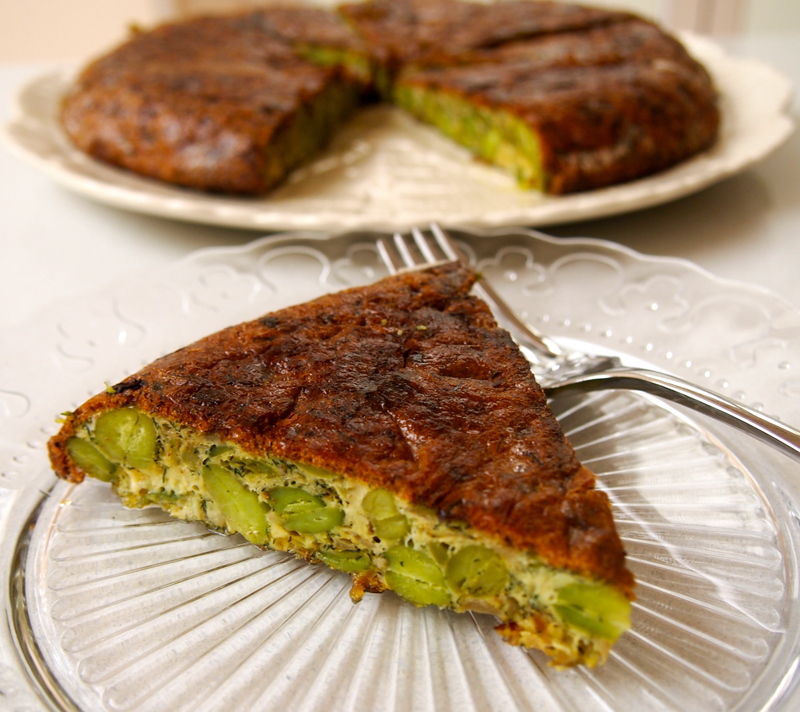 A somewhat similar kookoo to the broad bean is one that is made using fresh green beans that have been very finely sliced but the dill is left out and the amount of onions is doubled and they are caramelised until very golden brown. You would need about 400g of beans – the method of cooking is as per the broad bean kookoo. Thank you Leila, I hope you try it as it’s as delicious as it looks! Im really looking forward to trying this recipe. broad beans are a def fave !! thanks !! Hi Penny, I love broad beans too! Hope you enjoy the recipe – please write back and let me know how it turned out.